Black Wings is a power module for the standard bread board. It can fit for 3 kinds of bread board. It's concave design so will not waste your proto zone.This breadboard power shield support Mini USB power supply and Power jack 7-12V supply. 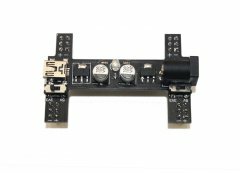 There are two independent power that 5V/3.3V optional. Tow power switchs on board can control each side voltage independent. Dieser Artikel wurde am Donnerstag, 20. Dezember 2012 im Shop aufgenommen.